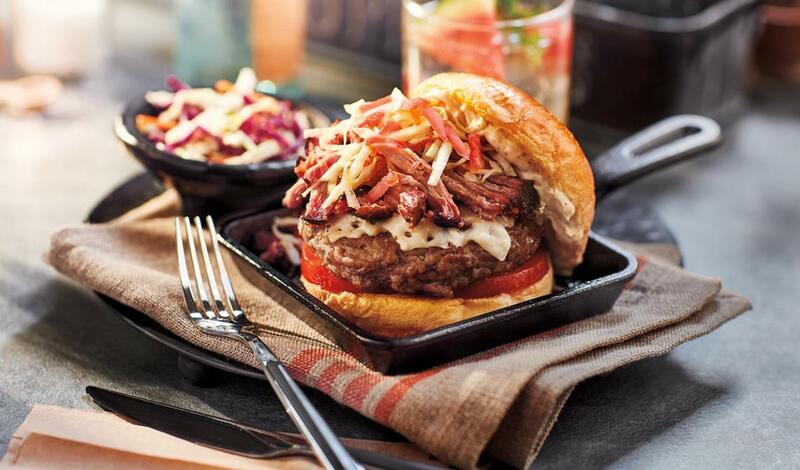 A pork patty with Swiss cheese topped with smoked pulled pork, tomato, house-made pickled watermelon slaw and Dijon mayonnaise. Combine Hellmann's® Mayonnaise Real and Dijon mustard. Combine vinegar, water, sugar, cloves, peppercorns and ginger, bring to a boil. Pour the pickling liquid over the watermelon rind and allow to marinate under refrigeration for at least 1 hour, or overnight. Drain rind and combine with cabbage. Reserve refrigerated. Cook pork patties to desired doneness and top with cheese. Spread top bun with Dijonnaise. Build burger with remaining ingredients.